European Imaging and Sound Association (EISA) has awarded Huawei ‘European Consumer Smartphone’ for the third consecutive year. 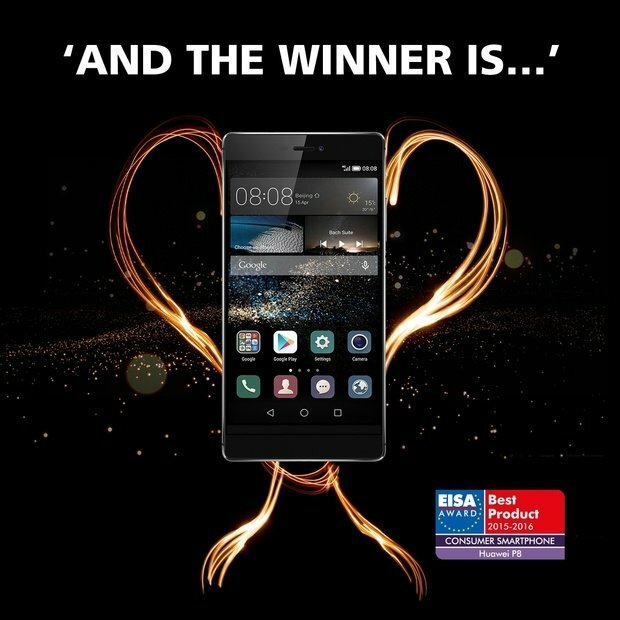 Huawei, a leading global information and communications technology (ICT) solutions provider, has been awarded ‘European Consumer Smartphone 2015 – 2016’ by the European Imaging and Sound Association (EISA) for its latest flagship smartphone, Huawei P8. This is the third consecutive year that Huawei has been recognized by EISA in this category. “improved camera performance and surprisingly high‐end craftsmanship that gives this affordable device a truly sophisticated appearance.” It highlighted its 2,680mAh capacity battery, f/2 lens developed for better low‐light performance and the P8’s excellent 5.2‐inch Full HD IPS‐NEO display. The low-light camera performance allows consumers to be more creative using the best light painting facility available on a smartphone and amazing crisp high contrast shots. The P8 also features a compact and powerful dual-antenna design plus rapid switching technology allows the phone to intelligently recognize the best mode reduces dropped calls and maintains a stronger signal. “We are proud to be presented with this award for the third year in a row. We are committed to challenging the industry and revolutionizing how a smart phone is used - the Huawei P8 is the most user-friendly smartphone for consumers globally,” said Glory Zhang, Chief Marketing Officer, Consumer Business Group (BG). In August 2014, Huawei Ascend P7 was named ‘European Consumer Smartphone 2014 – 2015’ and was praised for its ‘beautiful glass finish’, ‘attractive price’ and its 8-million-pixel front-facing camera and rear 13-million-pixel sensor with flash and supporting apps. Huawei Ascend P7 is now on sale in over 100 countries and has shipped more than 7 million units since it was launched. In 2013, Huawei had been awarded the‘European Consumer Smartphone 2013 – 2014’ for the ultra slim 6.18mm Ascend P6.